Breakfast has got to be my favorite meal of the day. I always wake up hungry and enjoy a variety of breakfast foods. However, I am not one of those Moms who make their clan a hot, nutritious breakfast every morning. Kudos to you if you are! My kids usually get a hot breakfast Sunday and Monday mornings when my hubby is off, that way we get to eat breakfast as a family. All of the other mornings my kids are very familiar with Toucan Sam, Tony the Tiger, and all of their friends. Though they are quick and easy to serve, I don’t dig all of the sugar and other not-so-healthy elements of these cereals. 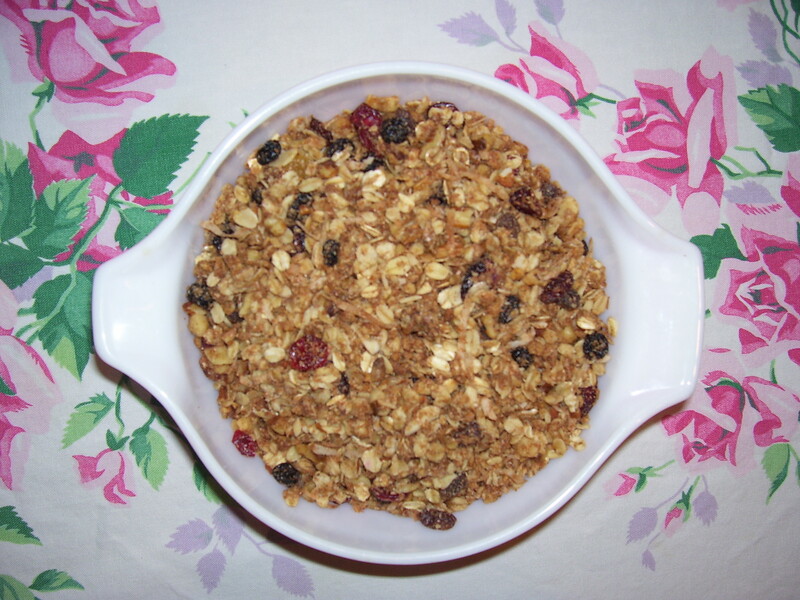 Recently my Mom came across an old recipe that she used to make for homemade granola. It was written on an old recipe card by our neighbor from almost 30 years ago! I don’t know about you, but I love to keep hand-written recipes from family and friends. When my Mom discovered this, we decided to make a batch for old times sake. My brother, who must have the memory of an elephant, remembered the last time she had made it, which was over 20 years ago. Mmmm, was it ever good! I enjoyed it in lieu of traditional cereal for about a week straight, and can honestly say it kept me full and satisfied much longer than other cereals. It is chock full of good stuff and doesn’t have any added sugar. So, if you’re looking to serve your family something a little different for breakfast, or just to snack on, give it a try! Another good thing about this recipe is that you can adapt it to the likes of your family, or adjust it if there are any allergies as well. Enjoy! Chock full of goodness, made with love. 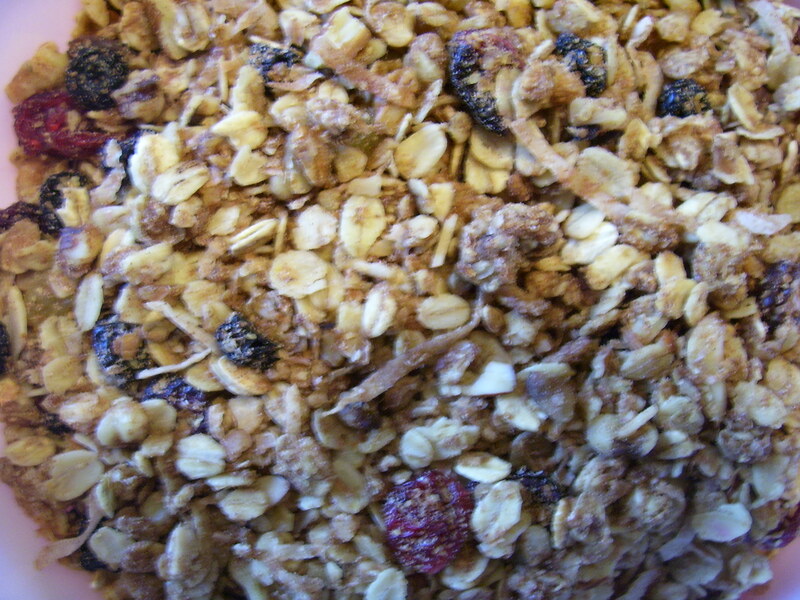 After the above ingredients are heated, add 6 cups of rolled oats. Bake 1 1/2 to 2 hours, stir every 20 minutes. After baking, add dried fruit (raisins, craisins, dried blueberries….) in any amount that you wish. Store in an airtight container. This recipe can easily be doubled. PS-Put some in a mason jar, add a handmade tag, and give to someone you love or appreciate!